The 3,000 mile route will start in Seattle, and go down south to Portland, before heading east through the Columbia Gorge and going on to Boise, Idaho. It will then turn southeast and go through the cities of Salt Lake City, Utah, and then Denver, Colorado, before then heading north again towards South Dakota. Then, I will ride east through to the Twin Cities and the Great Lakes, and pass through Chicago before arriving in Cleveland in early August, just in time for he USA Triathlon Age-Group National Championships, which I will be competing in. Shortly after I compete, I will be traveling to Dublin, Ireland, to speak at the 2018 Periodic Paralysis Association International Conference, where I will share the story of my Ride for Rare Diseases. 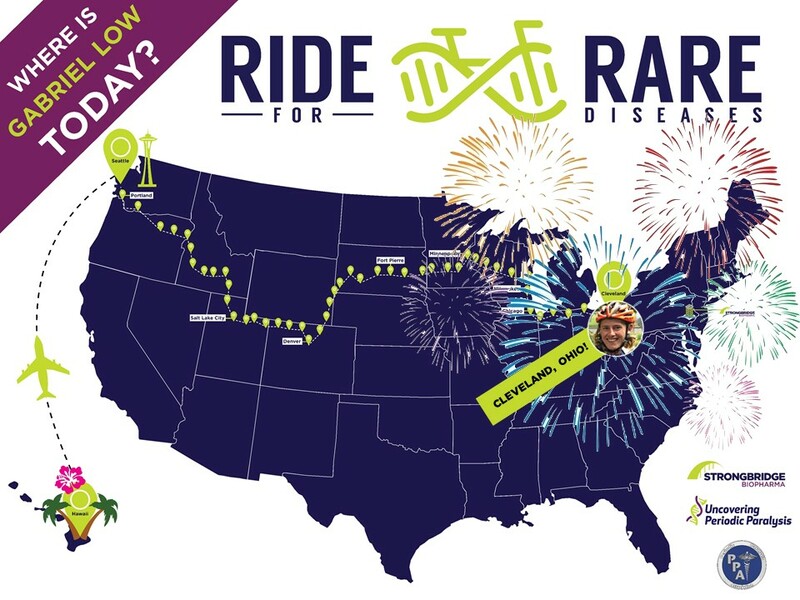 As a result of the tremendous support provided by Ride for Rare Diseases sponsor STRONGBRIDGE BIOPHARMA®, I am spending every night in a hotel. STRONGBRIDGE BIOPHARMA® is also supporting me with other essential necessities during my ride, including a support van, a new bicycle, public relations and media help, and, perhaps most importantly, food. Am I coming through your area? If so, come out and join me for a short section of the ride! Even if you are not a biker, still come say Hi while I ride on by. Please, let me know if you are coming through by messaging me through email or social media, which you can find at my Get Involved page.